Sam proclaimed this over a meatloaf dinner that Dave whipped up somehow while being on “point” for the kids as I finished the last long hours of editing a book. Deadline is this week…may slip from Tues but I’m still hoping it will stick this week. Good morning, boys. It’s 7am and thankfully you’re still asleep after several mornings of early “ups”. I’ve had my coffee and am starting to feel human. It’s quiet here, as I listen to our neighbor water her plants (hopefully hitting ours, too!). I love this picture of you two from a few days ago. I wanted to write you a note to tell you how much I love you. (Sam is walking down the hall now!). 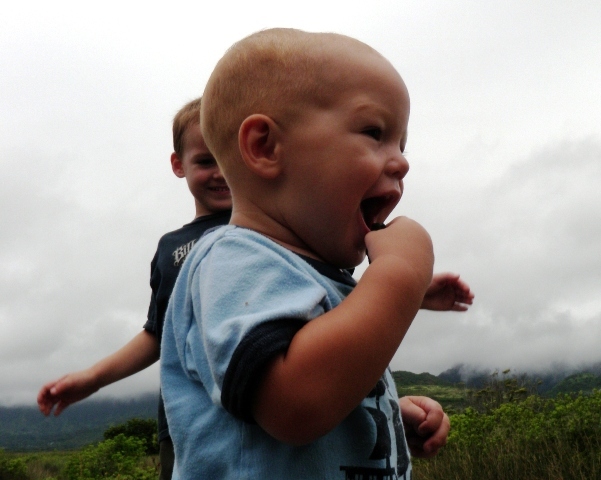 This was Ben’s first little hike on the marsh trail. He loved following you, Sam. He also loved picking up rocks and taste-testing them (yuck!). The little guy is so determined to be a big guy that he walked about 1/2 mile – just 100 yards shy of making it all the way home. He didn’t want to get back in the stroller. I kept trying to offer him a ride, but he’d writhe and squirm and protest, wanting to get out again. He is so strong! So, now that you are both up and looking for me, I must quickly jot down your “latest” news. 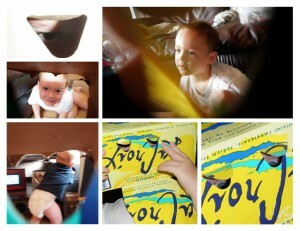 Sam, you just told me that someone said “You are the most cutest little boy!” I asked who, you said I don’t know. So I asked where you were at the time. You said “The marsh trail.” Nice, huh? 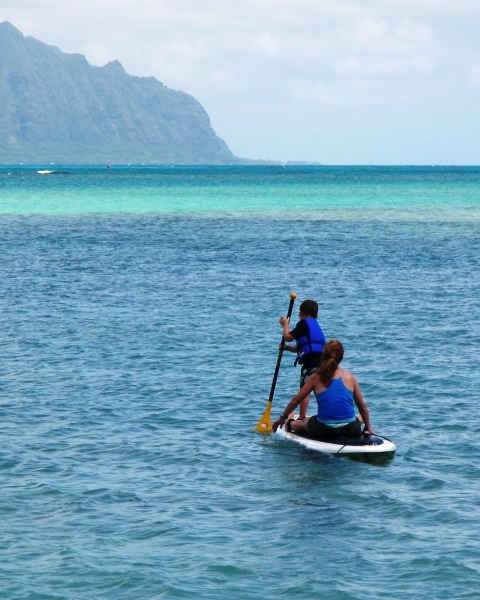 6 paddlers taking a Hawaiian canoe out for a spin in Kaneohe Bay! This is adventure day #3 🙂 Six of us (4 of whom had never paddled before) rented a Hawaiian canoe (wa’a) from base. We paddled out into the bay and learned the basics from our experienced buddies, Angel and Heidi. Angel called out the strokes for us (1 through 10, then hut, ho and switch) while Heidi kept us on course and the ama (the float portion on the starboard side) down so we didn’t huli (flip). We had a great time and got an awesome core workout! More pictures in the album (click photo above). Use decent rum, such as Cruzan. Bacardi would be ok.
My wee prince took me for a ride on a modern lily pad. Heidi and I took the SUP out to the beach this morning. Tide was high enough that my fin didn’t scrape the reef and knock us off 🙂 Heidi did a great job paddling all over and even spotted a turtle! 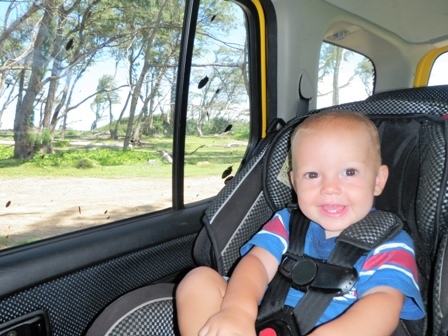 I went out for a bit then came back to pick Sam up – my favorite part of owning an SUP. The current was strong so we got a good workout! Then we picked up sushi and cake (eat cake every day of birthday week!) and had a picnic on Heidi’s lawn. 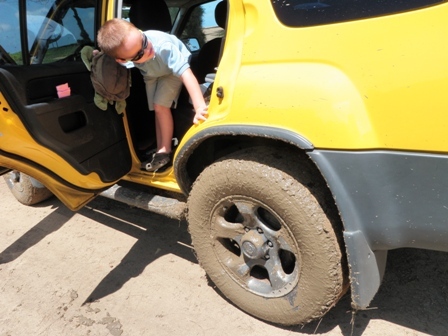 We got VERY messy – she had to hose the boys off! Lots of fun. Birthday adventure week begins at a gallop! Kathy, Michelle and I had a great (G R E A T !) 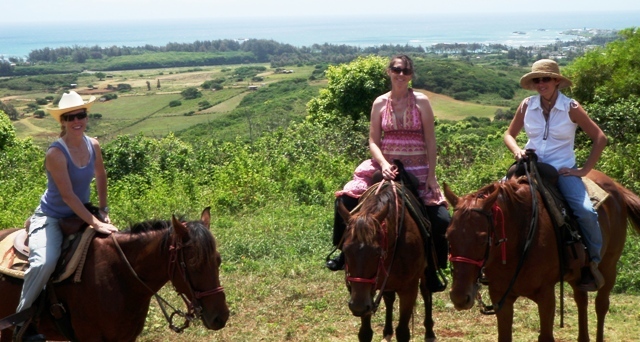 time galloping (yes, really) around at Gunstock Ranch up in Lai’e. We really enjoyed the trail ride on our horses, and I especially enjoyed quickly relearning how not to be intimidated by a smart horse who is trying to figure out just who’s going to be boss of the ride. Just for posterity-sake, my horse was Buster, Kathy’s was Scarlet, and Michelle’s was Kiahe (fire). Our guide was great (Sarah Jane). More pictures in album (click photo above)…tomorrow is stand-up paddling (since I won’t be able to walk!). Thanks for an awesome time, ladies! Happy first birthday, Big Ben! Sparkling water case has eye holes! We had some fun this morning with a sparkling water box – it already had eye holes and when you cut an opening for the neck, you end up with a nice breastplate! Can you see my beady eyes? I’ve been meaning to post this plant and legend for some time so I don’t forget when we move away…this is Naupaka kahakai (naupaka by the ocean). The well-known legend associated with this plant is that the half-circle of petals represents lovers separated: Kai (ocean) and Hiwa (entirely black). Frustrated by having to meet in secret, Hiwa split the flower in half and gave it to Kai before she ran to the mountains. 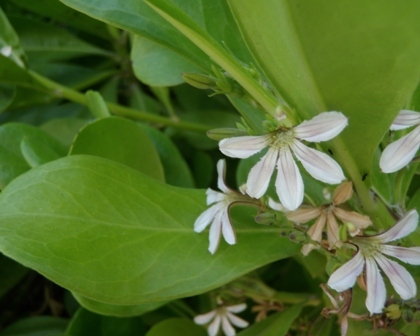 There are two variations of this endemic plant – Naupaka kuahiwi and Naupaka kahakai. The beach naupaka grows so well in dry, sandy soil in unrelenting sun. It’s a very hardy plant, and I’m hoping we will grow some when we landscape our little front garden. Both these pictures were taken while out on a jog this morning. 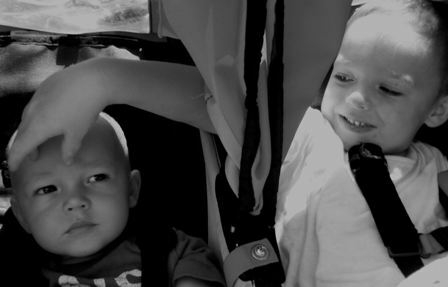 Here are my two boys, separated by a stroller divider but finding a way tease each other anyway! Ben is a big walker! Ben walking and Sam biking! We still have the plague here. Sam relapsed or still has the same cold, but he never complains and still wants to do all these things. I try to get him to rest, to no avail. Ben is still healthy. Dave has another week of school work before this batch of classes and heavier than normal work load is over. We are blessed, though. Others, whom we pray for every evening, are facing much more daunting days and bearing heavier burdens. 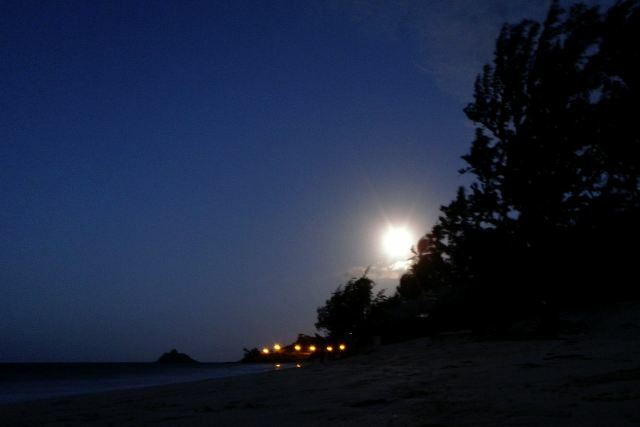 Full moon from Kailua Beach. We took a quick ride over to Kailua Beach to see the full moon tonight. Ben LOVES the moon and always points to it saying “bbbbooon!” (Make your lips go sort-of “bbrrrr” when you say it, like you’re cold.) Tried to take a video of him saying it over and over again, pointing the whole time, but there was no light for video. This is a long-exposure shot taken with camera resting on sand. Checking out the "paint job"! Nice spray to the top of Ben's window! 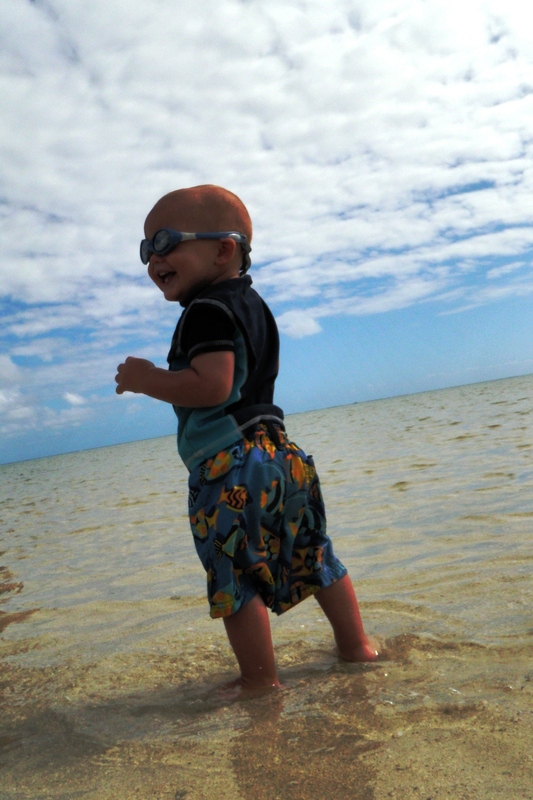 Our original plan was to go to the Bishop Museum, but Ben was still recovering from our all-out Maui trip (as am I!) and we ran out of time due to a loooong nap (during which I caught up on some work). Sooo…what is one to do? 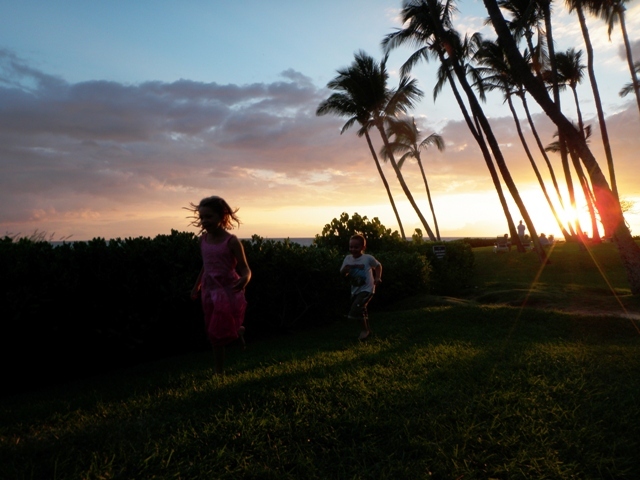 Sam and Makena running around while we grill dinner. 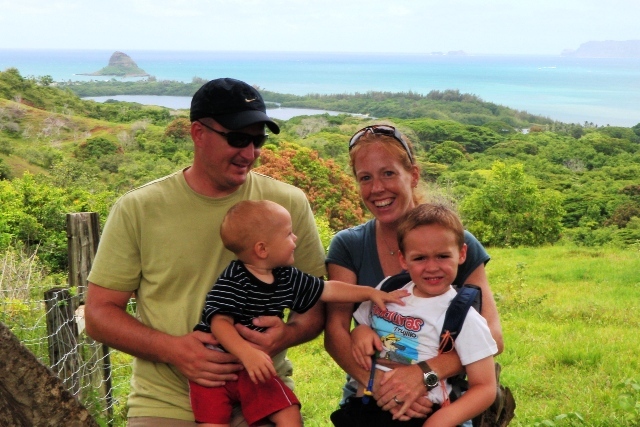 We had such a great time visiting my cousin, Leslie, and her family on Maui! They were visiting my aunt Pam and her husband Craig who own a timeshare there, so we crashed their party 🙂 Leslie is Sam’s godmother and I hadn’t seen her in 4 years, and had only met her younger daughter Makena once. It was so fun to get to reconnect with her and her wonderful family. Chad is such a great guy and the kids are awesome. Sam had an absolute ball getting to hang out with the big girls. He misses them already and can’t wait to visit in Washington. 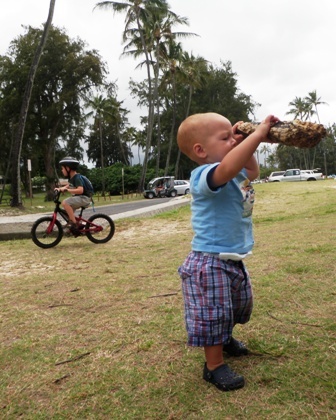 Every morning he would wake right up and want to rush out to see what the cousins were doing 🙂 We crammed a lot into the 4 days/3 nights – Haleakala, aquarium, hike, beach, snorkeling… Click on the photo above for all the pictures. Miss you guys!! !